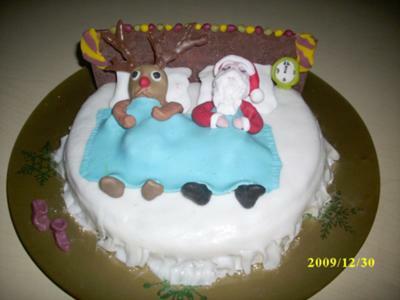 This is a traditional Christmas cake baked round but sliced a bit to attach the headboard to form a bed. After covering the bed I attached a sort of a frill all round except the straight part. By melting the chocolate I formed the headboard letting it cool down on a baking sheet making it a rectangular shape. Before it was completely dry I sliced it with a knife to be more sharp. I then put the pillows and formed the faces, making a type of a body underneath the blanket. After putting the blanket on their body, I positioned their hands and the feet. I made a clock near Santa to show midnight. Finally, I put the stockings on the headboard and some decorations and voila!